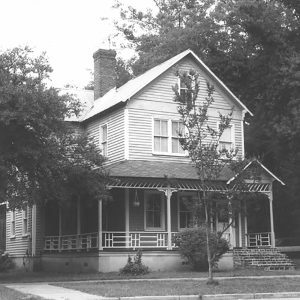 This house (c. 1890) was the home of Jonathan Alexander Baxter (1854-1927) a free-born son of a Charleston shoemaker and his wife. His family moved to Georgetown when Jonathan was an infant. He was educated in the public schools and became a teacher. In the 1870s Baxter became involved in politics serving as an alderman and a commissioner of elections. He served three terms (1884-1889) in the South Carolina House of Representatives after Reconstruction. In the Georgetown Historic District.